A sharpening stone is a plain stone block made of silicon carbide, aluminum oxide, or Novaculite. There is also a sharpening stone that's coated with crushed diamond known as the diamond sharpening stone. With that in mind, what's the best diamond sharpening stone out there? You can't just buy the first stone you see on an online search or at a kitchenware store shelf. The silicon carbide one is known as the Crystolon stone. It's an artificial or manmade stone that can be used for initial coarse sharpening of dull knives or even edge creation of raw metal. It's useful for getting edge back from even rusted knives. The India stone is the one made of aluminum oxide. It's a manmade type of sharpening stone you can use for fine-grade sharpening, specifically for the sake of honing the blade accurately or even when dealing with blade maintenance. The Novaculite sharpening stone is also known as the Arkansas stone. This is natural stone with multiple grits. You can avail of it as fine grit for the sake of fine edge sharpening and coarse grit for making edges. Depending on the grit, an Arkansas stone can pretty much accomplish the same things as the India and Crystolon stones. A diamond sharpening stone is a sharpening stone covered in diamond crystals. It's considered faster at doing either fine or coarse sharpening because diamond is the hardest substance known to man and it makes quick work of any metal surface whether it's coarse or fine in grit. Steel easily scrapes off of diamonds compared to just sandstones or water stones. Your stone should be coarse, rough, and gritty. These stones are the foundation of your sharpening toolbox. Essentially, the initial edge established by the coarse stone will cut sharper than a dull knife but you still need to perfect the edge with the assistance of a fine grit stone. However, how many of these stones and what grit should they be depends on how much of a sharp edge you need. Coarse Stone Sharpening: Sharpening with a coarse stone is about making the edge a good shape rather than just refining an existing edge (honing) or fixing the sharpening angle (realigning). When buying a diamond sharpening stone set or a standalone diamond sharpening stone, coarse stones is your best bet to getting a shapely edge or an edge with a shape that's conducive to better cutting. Fine Stone Sharpening: Meanwhile, a finer stone is what you need to get the edge details worked out. Just like how you need a chainsaw to make the rough shape of your sculpture then chisels to detail it, so too do you need a fine grain stone to sharpen or hone an established edge. As many a diamond sharpening stone review would take note, finer grits "refine" the edge in order to improve its cutting power. A dull edge won't cut well and should be reshaped with a coarse stone to get the sharpness back. You will progress from coarse to fine as you establish a new edge or restore the old edge of a dull blade. As you go through the fine grit of one diamond sharpening stone home depot after another, the cutting edge of your blade will continuously improve. Fine Stones Are for Refinement: Using only a fine diamond sharpening stone lowes to sharpen the dullest of knives is akin to using a chisel to carve a statue. It's needlessly tedious and tiring. A coarse stone removes more material and preps the edge better. Coarse Stones Are for Shaping Edges: In turn, using a coarse diamond sharpening stone amazon to get a fine edge is frustrating because it removes too much material. The coarse stone is for shaping and the fine stone is for refining the edge. A fine stone doesn't require much metal removal to really get that edge. The size of the blade you want to sharpen naturally requires a corresponding size of diamond sharpening stone ebay. Whether you're sharpening ordinary kitchen knives or a samurai sword, you should have the right stone that fit their length of blade and edge. A six-inch stone is a small sharpening stone and an eight-inch one is midway large. Anything larger than eight inches (you can avail of ten inches or twelve inches of stone sharpeners) is considered pretty large. You can also avail of smaller stones measuring four inches or even three inches. These are pocket stones that allow you to sharpen blades on the go. You can place your sharpening stones in tackle boxes, toolboxes, and so forth. However, for regular sharpening jobs, go with eight inches and above. Longer stones make it easier to sharpen knives while it'll take you longer to sharpen them with a palm-sized stone. The length of the stone is far more important than its width as far as knife sharpening is concerned. A small knife can be easily sharpened by a large stone but a large knife cannot be easily sharpened by a small stone. The longer the stone the better because it takes fewer strokes to sharpen the blade, thus making it better at maintaining an ideal and consistent sharpening angle. When it comes to woodworking tools like diamond sharpening stones for chisels, plane blades, and chisels, you need stones that are as wide as the blades themselves. This time around, width plays a greater role. What should you be looking for when buying a diamond stone for sharpening? Here's an overview. In regards to diamond sharpening stone vs waterstone, the diamond ones are superior due to their hardness while the water stone ones tend to have issues with dipping or hollowing (in which case, you should purchase a truing stone to keep them flat and level). There are diamond sharpening stones available for every budget. Just remember that you get what you pay for and if you become stingy when it comes to these stones, you're likely to get a non-long-lasting stone. On the other hand, not all expensive stones are the best stones and you still need to make a price to quality comparison when all is said and done. The main reason it got to the top spot is because it satisfies its customers and there were few to no complaints in regards to its quality control (which dragged down the scores of its competitors). The ultra sharp diamond sharpening stone emphasizes cost-effective value. Although the guide had a warning in regards to "getting what you pay for", the Ultra Sharp brand of Diamond Sharpening Stone tops this list because it gives you more than you bargained for (in a good way). It comes complete as diamond sharpening stone set, for one thing. For another thing, it comes in different grits of 300, 600, and 1,200 grit stones measuring 8 inches by 3 inches. It even includes a universal stone holder and quality that many a customer can vouch for. It can sharpen all sorts of tools and knives along with the hard-to-sharpen ceramic knife thanks to its quality distribution of diamond grit. This package is probably rated lower than the three stone set because it only includes two stones. It's still great value for your money, which is why this diamond sharpening stone ultra sharp this gets the second spot on this top five list. It features 600 and 1,200 girt diamond sharpening stones. So it has the coarse 300 grit stone missing from its lineup compared to the more complete set mentioned above, and its score reflects that fact. With just a drop or two of water, you can hone anything on this, including carbide lathe tools because of its very flat surface and heavy steel substrate. Nevertheless, this diamond sharpening stone usa package ensures better blade honing with light pressure and fine stones that quickly sharpen anything with a cutting edge. You can't use it to make an edge out of raw metal though. It lacks the all-around utility of the other Ultra Shop product package deal. The main claim to fame of this brand of sharpening stone over the Ultra Sharp brand is its dual-sided sharpener whetstone. One side is 300-grit for coarse sharpening and the other side is 1,000-grit for fine sharpening. The eforlife diamond sharpening stone is two stones in one. When using a diamond sharpening stone, you can expect durable sanding and sharpening from it because of the durability of diamond. It doesn't hollow out as easily as other materials because diamond is really hard. Harder than the steel it's supposed to sharpen. It lacks a bit in terms of size, which is 7.8 inches by 2.6 inches by 0.3 inches. In other words, it's smaller than 8 inches by 0.2 inches, thus explaining its low rank on this list. It's still a great stone, mind you. However, the package deals of Ultra Sharp outdo it in many ways. However, it still delivers enough of a quality performance because of its ability to level other stones and whatnot. The fourth best diamond sharpening stone on this list just happens to be one of the more popular brands out there. This dmt diamond sharpening stone comes as a standalone stone rather than a package deal, which kind of explains why it's placed low on this list. It's also an all-America stone that's made in the USA (or a diamond sharpening stone america). You're assured of American standards and high quality across the board. It even has a sharpening surface designed to specifically accommodate a wide range of edges, from small pointed tools to large knives. 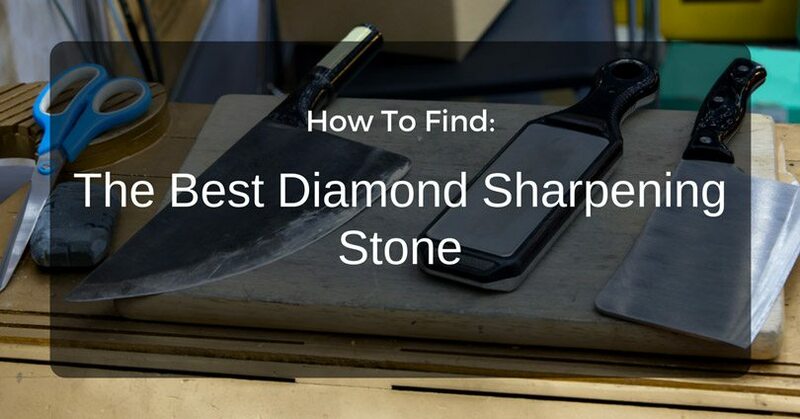 It got its placement on this list despite also having a quick-sharpening monocrystalline diamond surface like all the other diamond sharpening stones featured on this review because of DMT's quality control problem. You can sometimes get a good stone but there's a risk of getting a low-grade one too. You'd think that this particular diamond sharpening stone dmt package would rank higher than the standalone DMT sharpening stone, but that's not the full story. Yes, you get three sharpening stones on this package that feature coarse, fine, and extra fine grits. You'll also have a product that sharpens faster than conventional stones thanks to the same monocrystalline diamond surface technology that doesn't require oil to sharpen. You can sharpen your knives by whetstone (with water) or dry stone (without water). When it comes to cleaning a diamond sharpening stone, this one also shines because it's easy to clean because there's no need to add oil to it. It's also constructed durably, thus ensuring reliable service and consistent performance through the years. Alas, DMT quality control has dragged its scores down enough to make a package deal rank worse than a standalone one from the same company. Rather than purchase a diamond sharpening bench stone or a diamond sharpening stone - hone block, you should instead get an 8-inch (or longer) diamond sharpening stone to fulfill all your knife sharpening and honing requirements. As far as the best diamond sharpening stone is concerned, the winner is Ultra Sharp Diamond Sharpening Stone Set. It's a package deal with a bulk discount but you won't feel like you're being gypped because the quality of the individual stones themselves will satisfy you. When you shop to buy diamond sharpening stone package deals, the ones offered by Ultra Sharp are some of the most cost-effective bargains you can get in light of their inclusion of universal holders and ability to keep your blades and tools (like chisels) as sharp as the day you bought them.